The Anima Mundi, or Psyche Kosmou, is the cosmic soul, or psychic substance, of the universe. Sometimes it is loosely referred to as "the Aethyr", meaning not so much the fifth Element as the subtle world in general. In the interview at the Chapel you, honoured Lady Aquila, said: “visual styles can be bearers of light and may originate in the aethyr – or if you prefer, in the depths of the human psyche”. I really stumbled over this part of the sentence because the aethyr and the depth of the human psyche are two quite different things (not that ‘thing’ seems to be the right word – please forgive my lack of eloquence). I hope it does not seem like annoying hairsplitting, but it really irritated me that you should say it is a matter of preference since the “psychological explanation” for everything non-material is not what I am used to from the Chapel – but perhaps I misunderstood. I certainly see what you mean about my reference to “the aethyr – or if you prefer, in the depths of the human psyche”. I can see how that could be very misleading (I am actually wondering whether I should ask the Chapel to let me submit a footnote). What I was trying to say was rather complex, and I wasn’t giving a lot of time to that aspect of it as I was really discussing something else. Let me try to explain in more detail what I actually meant. To begin with, are “the aethyr” and “the depths of the human psyche” equivalent? In certain respects they can be, but not for the human-centered “psychological” reasons that (I admit, most unfortunately) might lead a New-Ager or even a materialist to make a similar kind of statement. In fact for the precise inverse of those reasons. By “the aethyr” in this case – which is admittedly a loose term – I was meaning the Candric or Lunary domain, the realm of the Anima Mundi or cosmic soul. In other words, the domain where the Solar Archetypes first enter (or, more accurately, are reflected on) the domain of flux and change, before they reach the “material” level. Now, the human psyche (or the psyche of any Axial being) and the world psyche, or Anima Mundi, are closely interlinked. The actual borders between them are difficult precisely to define. Naturally also when I say “human psyche” I am not looking upon it (as West Telluri tend to) purely as an individual phenomenon, and certainly not as a by-product of physical brains. The traditional view of the human psyche is not as a compartmentalized collection of unique and indivisible consciousnesses, locked permanently in a collection of unique and individual biological heads. The traditional view of the human psyche is as one part, or area, of the Anima Mundi. An analogy might be to say that the Anima Mundi is like the Great Tellurian Ocean. The human psyche is like one particular sea (say, the South China Sea). The waters of the Indian Ocean and the Pacific flow freely through it, and indeed it is part of the Indian Ocean and ultimately part of the Great Tellurian Ocean. Individual human psyches are like tiny, tiny bays formed where the waters of the psyche meet the material ground. Being somewhat sheltered they have some static water (their “own consciousness”) that doesn’t change – or at least doesn’t change too quickly. But of course the waters of the South China Sea and of the Pacific and Indian Oceans, and ultimately of the Great Tellurian Ocean, flow through them. When I said that “visual styles can be bearers of light and may originate in the aethyr – or if you prefer, in the depths of the human psyche”, I was regarding the “depths” of the human psyche as being those other waters with which it is always connected. The more an individual psyche is in touch with its “depths” the more it can manifest true and pure things from the higher regions of the Lunary Realm of the Anima Mundi. And that is where “true” images come from and why such wonderful things (like Art Neo or some aspects of anime) can appear, as out of nowhere, through the mediation of human psyches. Well, that took quite a lot of clarifying, but it is the background to what I was saying. I am afraid this way of looking at things is so natural to me that I can forget that, in referring to it casually, I may be giving a very misleading impression. Please forgive me. I do hope this clarifies the matter. I am happy to discuss it further if necessary. The Anima Mundi, or Psyche Kosmou, is a Platonic term in the West, though it has analogues in most traditions. Would you say the concept is similar to the Sanskrit Atma concept – the Spirit who is the self in all beings as well as the Universal Self? For the Spirit is One, and I am the Spirit. And you are the Spirit also, in the innermost temple of your heart. There is a relationship to the concept of Anima Mundi, but we must be careful to distinguish the soul, or psyche, which is lunar, from the Spirit, or Atma, which is Solar. The lunary or psychic domain is the middle term between earth and Heaven, or earth and the supernal Sun, just as the Lunar Daughter mediates the Solar Mother's love to fallen beings. So, while there is a relationship between the two concepts (particularly, for the modern mind, in that they both contradict that West-Tellurian individualism that sees the jiva, or individual consciousness, as being as something fundamentally separate from consciousness as a whole), they are by no means the same thing. The Atma belongs to the Heavenly and Solar, the realm of the Archetypes that are "changeless beyond the impermanent flux of time", to quote Scripture again. The Lunary or psychic realm is already a realm of flux and change: the psychic waters upon which the changeless Forms are reflected – and distorted by the constant movement of the water. As you see in the old image at the head of this page, Anima Mundi, or the Lunary Realm, gains her reality from the chain that connects her to Heaven, while the earthly realm gains its reality from the chain that connects it to the Lunary. Without soul or psyche the human being would be no more than an ape (as shown in this picture) – which, rather fascinatingly, is precisely what a recent purely material "science" that, by definition, must ignore the soul, believes human beings to be. So your analogy of the Anima Mundi as the seas is not a purely arbitrary one? Not at all. The physical moon governs the physical seas. The association of the psychic stratum with water, and particularly the sea, is fundamental. In fact, it is true to say that that is what The Sea essentially is long before it became a body of material water on any particular planet – just as The Moon is essentially the Light of the Lunary domain, long before it was represented by a particular satellite of any particular planet. So the Anima Mundi, or the Lunary Domain – are we talking about a "being" or a "realm"? This question, again, is very bound up with West Tellurian "individualism". The distinction is not actually a very real one. What is a "domain" anyway, when we are no longer speaking of physical space? What is an "intelligence" or "being" when we are no longer talking about the apparent individual beings that appear to exist in our material worlds? We can speak of the Anima Mundi, or Lunary Realm in either way and be equally correct. It possesses all the qualities of both a traversable region and an intelligence. Through Thy power of nescience doth the world appear, like to a rope appearing as a serpent or as a garland of flowers. Through Thy power of Knowledge Thou dissolvest the world back into thine own Self. Glory unto Thee, the Empress of the Universe. Now the idea that the world is an "illusion" is meaningless if we take it to mean what individualistic Western psychology can only understand it to mean: "a delusion in the mind of the individual". No, the "ignorance" or "nescience" (avidya) that creates the world is cosmic. Consciousness is not restricted to individuals: it is part of the very structure of being. And nescience is not inherently a "bad thing" – it is the creative "illusion" that gives rise to all things as part of the eternal Play of the Divine Lalita (She Who plays). Why there is Creation at all is a mystery too great for us to examine here. 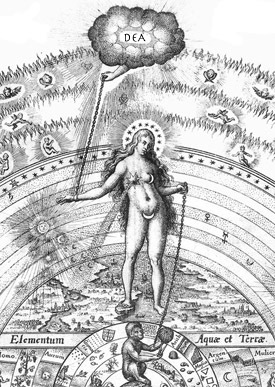 But what we need to understand is that between the Heavenly/Solar Mother, who does not enter into Creation, though She gives rise to it, and the earthly realm of material things (and not just physical matter), lies a Middle Realm that is absolutely essential to the existence of anything whatever: the Lunary Domain, or Anima Mundi.